[UPDATED Oct. 21, 2010] Contestants from all over the United States and the world have sent in their new GNSS apps to the USA Challenge — the North America regional contest in the 2010 European Satellite Navigation Competition (ESNC). The judges, all GNSS business and technology experts, have ranked the submissions. And the five best satellite navigation applications ideas are . . . Transforming mobile devices into secure voting machines and an interactive LBS smartphone app — both from New York, a virtual reality augmentation for automobile windshields from California, multi-source traffic information app from Michigan, and a parking locator app for handicapped drivers from Spain. Inside GNSS will announce the winner of USA Challenge, on October 18 following the ESNC awards ceremony in Munich, Germany. The winning application will reach 35,000 GNSS experts in a cover story in the November-December issue of the magazine. The USA Challenge winner will receive a $1,000 cash prize from the regional competition sponsors, Inside GNSS magazine and GNSS OEM manufacturer NovAtel. The winner also will spend two days consulting with the experts of the Position Location and Navigation Group (PLAN) at the University of Calgary in Canada. 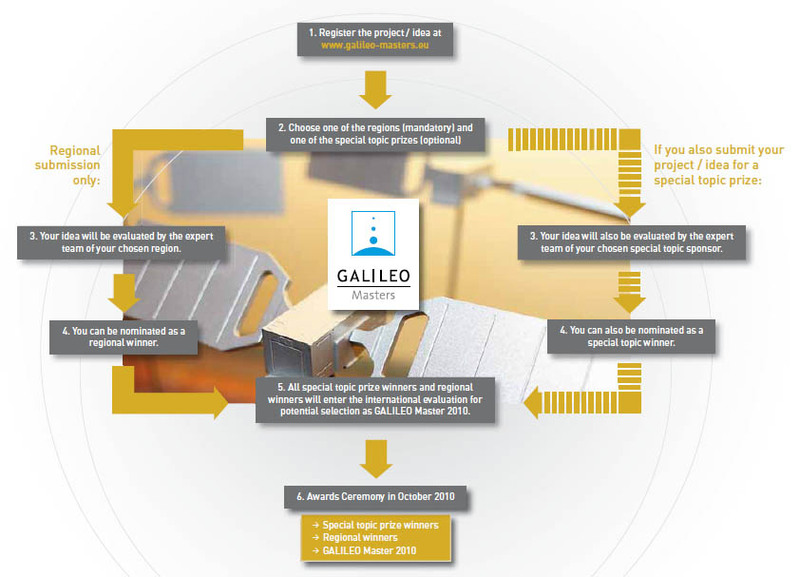 All of the prizewinners will gather in Munich, Germany on October 18 to celebrate and find out who wins the big €20,000 prize (US$26,000) — the Galileo Masters Award — as well as a series of special-topic prizes. This is the first time the United States and Canada have participated in the seven-year old Galileo Masters, officially called the European Satellite Navigation Competition. Regional and special topic prizes add more than €1 million (US$1.3 million) in cash and business incubator support to the total. Some 24 regions in Europe, Asia, and the Middle East participated in 2010, but contestants were not limited to their home region and could enter another regional contest if they chose, as well as any of the six special topic contests. THE APP: Eases start-and-stop driving by showing drivers how fast they need to travel to make the next green light on their GPS-enabled Blackberry and, soon, Android smart phones. HOW IT WORKS This advanced driver assistance system (ADAS) application is an interface that allows users to measure and monitor traffic signal information: type, geo-location, geo-direction, and signal phasing and timing (SPAT) data. “Where the solution gets interesting is its ability to use information from cross-modal sources such as traffic controller centers, infrastructure to vehicle (I2V), and direct end-users (drivers) to give the most accurate traffic signal status,” Gonzalez says. The multitude of sources allows the solution to display traffic signal status to the driver far before an intersection, when exiting freeways or traveling down long roads. THE APP This project idea consists on a location and occupancy control system of parking spaces for handicapped people, which employs GPS location and ID control. The system could be executed on mobile phones, PDAs, and different kinds of mobile devices with Internet access. HOW IT WORKS GPS technology will be used for dynamic localization of users cars and static localization of parking spaces. The other technologies used in this project are Android and Symbian operative systems, JAVA, .NET, C++ and, for signal processing: voice, stroboscope images, dermatological images, MRI and f-MRI images. Also, Zigbee, X10, EIB, KNX protocol, GPS, Bluetooth Biometrics and domotic sensors. THE APP: a geolocation platform that transforms smartphones into trustworthy voting machines for government elections, shareholder proxy elections, and entertainment polling. HOW IT WORKS “Our software-as-service applications combine location-based services with mobile phone SIM card security for trustworthy voting,” says Klein. Voters register by mobile device, either online or offline. At voting time, eVOTZ applies a simple geo-location technique that analyzes “latitude, longitude, radius” at the time of a mobile vote and compares that by geo-fence matching to a pre-approved distance range. If they match, the vote is accepted. HOW IT WORKS This smartphone app is connected to one of the largest databases of historical markers’ text and their GPS coordinates in the United States. It uses GPS to evaluate existing locations and compares it to a dataset to see if the user is within range to view the marker. If so, the smartphone “reads” the text aloud as it activates. The system is hands-free and requires no physical interaction. Users can also upload their own 200-character count text on a website — history, advertising, or tidbits of information about a place, which will then activate at the proper location for other app users. For this app, accuracy is not as important as availability — in addition to GPS, the concept can be applied to equivalent location systems. THE APP: Virtual Cable heads-up display GPS navigation is an augmented reality application to deliver GPS navigation information more clearly to drivers. HOW IT WORKS "Current GPS systems distract the operators gaze from the real world to animated two-dimensional maps, with a distinct lag as the brain interprets the map information and applies it to the route," the company said. "Virtual Cable presents a fully stereoscopic 3D wayfinding line visible right through the windshield; following the contours of the terrain, presenting the information as a natural part of the landscape." The application can also be used by pilots taxiing on the runway and for construction, agricultural and military vehicles and even in medical procedures. Ralph Eschenbach is on the board of directors of Sand Hill Angels, Silicon Valley entrepreneurs who invest in promising technology startups. He is a former vice-president and chief technology officer at Trimble Navigation. Neil Gerein is a Canadian GNSS systems engineer and aerospace and defense product manager for competition co-sponsor NovAtel, Inc., and an expert in Galileo receiver design. Hans Kunze is a GNSS engineer and business consultant who has worked in international business development at GPS companies for 20 years. Gerard Lachapelle has been involved in GPS systems since the early days. He holds the CRC/iCORE Chair in Wireless Location at the University of Calgary Department of Geomatics Engineering and heads the school’s PLAN Group. Grace Gao, a researcher at the Stanford GPS Lab, was the first to derive the code generators for Galileo and Compass signals. Chris Wilson is strategic research director for digital mapmaker Tele Atlas. He developed the concept of probe-based mapping and holds several patents in this area.